Hales was signed by the franchise as the replacement for David Warner. The Indian Premier League (IPL) is fast running towards the business end as the race for the playoffs is heating up. While the other teams are sweating over their combinations, Sunrisers Hyderabad (SRH) are enjoying themselves after becoming the first team to go through the knockouts. No wonders the environment in their change room is wonderful as the players are enjoying each other’s company. However, Alex Hales seems to be learning Hindi from his teammates during his stay in the country. The Orange Army is currently in Bangalore for their upcoming game against the Royal Challengers Bangalore (RCB) at the Chinnaswamy Stadium. 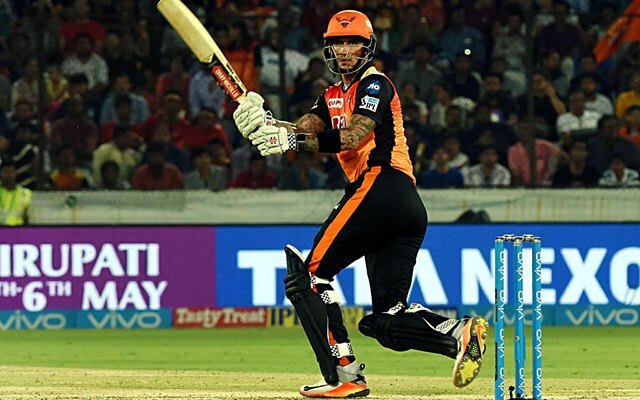 The encounter holds a greater significance for the home side and it is possible that SRH might give an opportunity for some of the players who have been warming the bench this season. They will also be looking to keep the winning momentum going into the playoffs. Alex Hales was signed by the franchise as the replacement of David Warner and the England opener has so far fared decently with the bat. He has also gelled well with the teammates as they are seen enjoying their time with each other. However, it seems that Hales has found a Hindi teacher in the squad as he recently commented in the same language on Instagram taking a funny dig at Khaleel Ahmed latest post. 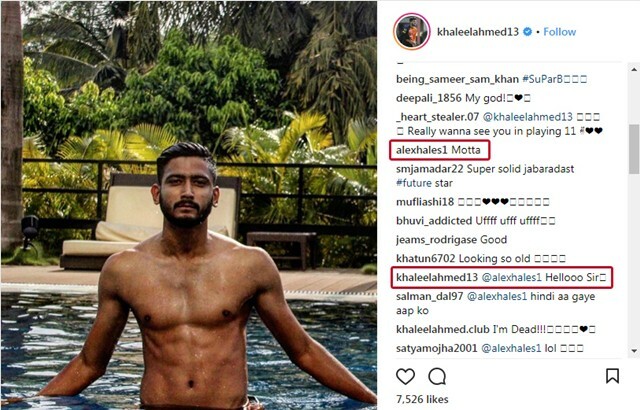 The young speedster posted his image on social media with an interesting caption which read, “When you can’t find sunshine, be the sunshine #summertime #riseandshine #ipl11.” He was showing off his perfect body while in the swimming pool in the picture on which Hales commented, “Motta” which means fat. The fans absolutely loved the fact that the English cricketer was trying to learn one of the official languages of India and also enjoyed the conversation between the two.